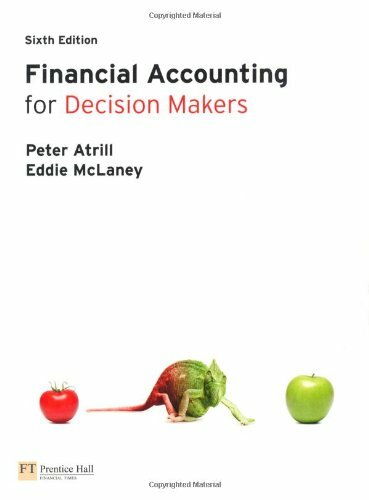 A comprehensive and accessible introduction to the subject, Financial Accounting for Decision Makers focuses on the ways in which financial statements and information can be used to improve the quality of decision making. By introducing topics gradually and explaining technical terminology in a clear, friendly style, the authors cater both for accounting students, and for those studying entry-level accounting within another field. A practical emphasis throughout the book ensures that the material is always relevant and suitable to the decision makers of the future. Interactive 'open-learning' style, ideal for self-study, encourages you to check your progress continually. NEW chapter examining supplementary financial reports prepared by businesses. Fully integrated coverage of International Financial Reporting Standards (IFRS). NEW sections dealing with key standards and standard-setting issues. Numerous activities and exercises enable you to constantly test your understanding and reinforce learning. Updated and expanded chapter on corporate governance outlines the issues and potential problems inherent to the separation of ownership of a company from day-to-day control. Colourful and relevant examples from the real world, including company reports and survey data, demonstrate the practical application and value of concepts and techniques learnt. Key terms, glossary and bulleted summaries providing excellent revision aids. Visit the student companion website at www.pearsoned.co.uk/atrillmclaney to access a host of student study resources including multiple choice questions and links to useful websites. Suitable for all those studying an introductory course in financial accounting, who are seeking an understanding of basic principles and underlying concepts without detailed technical knowledge. Peter Atrill is a freelance academic and author working with leading institutions in the UK, Europe and SE Asia. He was previously Head of Business and Management and Head of Accounting and Law at the University of Plymouth Business School. Eddie McLaney is Visiting Fellow in Accounting and Finance at the University of Plymouth. Peter Atrill is a freelance academic and author working with leading institutions in the UK, Europe and SE Asia. He was previously Head of Business and Management and Head of Accounting and Law at the University of Plymouth Business School.Eddie McLaney is Visiting Fellow in Accounting and Finance at the University of Plymouth.